The Barn Owl may be the best known owl in the world. The upper parts are orange-buff, spotted with dark grey and white. The underparts are white and the tail short. The male's breast tends to be more white, the female's more spotted brown. The heart-shaped facial disc is usually white. It is sometimes called the monkey owl because of its simian appearance. The long legs are completely feathered. Barn owls have a serrated comb on the claw of the middle toe, found elsewhere only in herons and some goat¬suckers. Females are about 13 to 18 inches and are larger than males. Their eyes are large and dark; the wings are long. Their hearing is exceptional. They can locate prey in total dark¬ness just by sound. Their ears take up nearly the whole length of the skull. They hiss, scream and utter a series of clicking sounds, but do not hoot. The range of the Barn Owl is worldwide between latitudes 40° north and 40° south. Barn Owls inhabit open country with grassy fields and low brush. Gestation is 31 to 34 days by both male and female, but the female is chiefly in charge. The barn owl is a flying mousetrap. Each family consumes an estimated 1300 rodents per year. Meadow voles are their chief prey and if the supply of these rodents fails they may employ drastic population control measures, including abandonment and cannibalism. 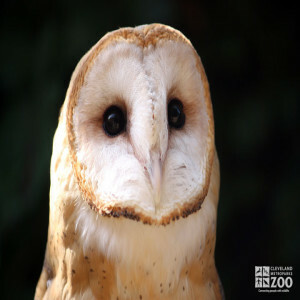 The barn owl is currently classified as endangered in 6 states, including Ohio . Large numbers of mice and rats occur wherever crops are grown, attracting this rodent-hunting owl. As urban areas expand the environment this owl favors diminishes. Barn owls are non-migratory and flocks of 40 have been observed. They move in parrot-like fashion on tree branches and can jump nearly 2 ft. without using their wings. Barn owls are monogamous, pairs being faithful to breeding sites (often old buildings or abandoned houses), using the same one for years. No nest is built, rather regurgitated pellets serve to cradle the eggs. Altricial young are fed by both sexes. Mortality among the young is very high: nests are insecure, eggs and young fall to the ground, and sibling rivalry can lead to starva­tion, trampling to death or even cannibalism by a nest mate. The young fly in about 60 days and are independent in about 10 weeks.